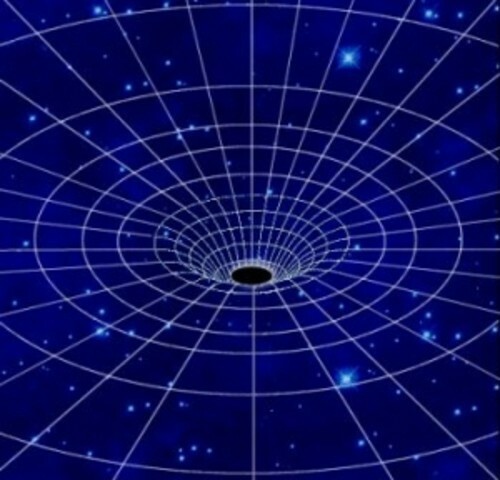 When we think of a black hole, we normally think of its event horizon. The “point of no return” as it is often described. Much of the debate over Hawking’s new paper has been over whether black holes have an event horizon. But black holes are defined by more than their event horizon. There are, in fact, several different kinds of horizons, and these become important when you are taking about dynamic black holes that are growing in size or losing mass through Hawking radiation. In general relativity we often define things in terms of the behavior of light. One way to visualize this is in terms of what are known as light cones. Suppose you were to flash a light where you are at this moment. The light would speed away from you at about 300,000 kilometers per second, which is known as the speed of light. In general you could point the light in any direction, so flash of light would in general be an expanding sphere of light.Since nothing can travel faster than the speed of light, then that expanding sphere marks the limit of your influence. After one second it is about 300,000 kilometers in radius, for example, and that means in one second you cannot do anything beyond that range. You can’t get a radio signal to someone more than 300,000 kilometers away from you in a second. In general, you can’t move outside that sphere in one second, because you can’t travel faster than light. It can be difficult to visualize this sphere of influence for a point in space, so often it is visualized by imagining space as a two-dimensional surface, like a sheet of paper, and time as being the third dimension. You can imagine it as a stack of paper, with a cartoon drawing on each page, then flipping through the drawings would make them appear to move. Each sheet of paper would be a moment in time, and different pages in the stack of paper would be different moments in time. The only difference is that time is a continuum rather than discrete instants. Behavior of light cones near an event horizon. In this visualization, an expanding sphere of light would start at a point, and with each higher page would be a larger and larger circle. If you flipped through the pages you would see an expanding circle of light. If instead you could see through the paper and just look at the circles, then you would see they form a cone starting at a particular point. This is known as a light cone, and it defines the limit of influence of an object at the point. An object at the starting point cannot influence anything outside of that light cone, nor can it ever move beyond the limit of that light cone. Even though our limit of influence is an expanding sphere, the cone visualization is so useful we refer to the sphere of influence of a particular point as its light cone. You can also trace the cone backward in time, which defines the limit of things that can influence our object. 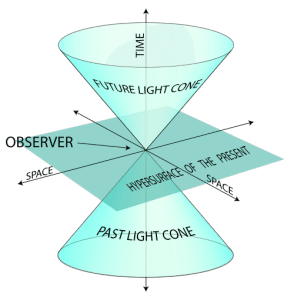 To be able to interact with an object you must be within its past light cone, and to be influenced by an object you must be within its future light cone. In general relativity, gravity is a warping of space and time, so the presence of mass distorts the light cones. Any mass warps space around it, which cause the light cones to tilt toward it slightly. For most masses this tilt isn’t significant, but it is significant close to a black hole. In fact, there is a distance at which the light cone tilts to the point that the edge of the cone is vertical. This means it is impossible for you to get further from the black hole, you can only get closer. This point is known as the event horizon. Get closer than that distance, and it is impossible to leave the black hole. For a static black hole this is a pretty good definition. But the event horizon isn’t simply a property of space, as the simple “point of no return” idea implies. The event horizon is a global property that must be true for all time. Once light is trapped by the event horizon it must be trapped forever. This becomes a problem if you have a black hole that is not forever static. In the real world, no black hole is static. They either gain mass by capturing material, or (theoretically) radiate energy through Hawking radiation and lose mass. In many ways the event horizon is the least useful horizon when talking about dynamic black holes, because you need to know the structure of the black hole over all time in order to know its event horizon. For this reason, we often use what is known as the apparent horizon. The apparent horizon can also be defined as the point where light gets trapped, and can be visualized just as we did for the event horizon above. But the difference is that the apparent horizon is local, meaning that it applies for a particular instant in time (and from a particular vantage point, but we won’t go into that complication). The apparent horizon is what is typically described when talking about black holes. It is the apparent horizon that looks like the point of no return. For a static black hole the apparent horizon and event horizon are the same, but for dynamic black holes they are not. For example, when a black hole accretes matter, over time its mass increases. This means that the apparent horizon at a particular time is within the global event horizon. If an astronaut were falling into a black hole, they would cross the event horizon before reaching the apparent horizon. For a growing black hole, you would be forever trapped before you realized you were trapped. As long as tidal forces aren’t strong, you could cross the event horizon without even noticing it. There are other horizons as well, such as the Cauchy horizon, Killing horizon, and timelike limit surface. They each have different definitions and uses, but outside of technical papers you’ll rarely hear of them. Long story short, black holes are complicated structures, and there are subtle aspects to their horizons that can be difficult for even experts to wrap their heads around. Surgestion a refferrnce solar masses give different results. How ever dose gravity have a constant? Velocity? Symmetry is destroyed? The inward pull of material of the black hole rotating close to speeds of light same for the matter at the event horizon when feeding. Quarars,quantum theory of gravity? Quantum theory of spacetime? 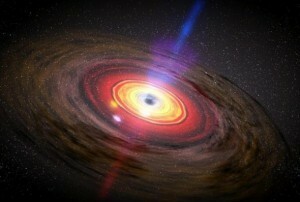 Primordial black holes not observed decaying! Cosmic microwave background have detected swirls its presentation shows black holes detection. Does the Singularity posses an entangled Anti-Singularity? Would it be best described as a binary system of symmetry and a precursor to the background radiation imprint? The model MC (-Pi) = MC (Pi), 0 = 1, a cube that equals a sphere in five dimensions?